At the recently concluded Seoul Motor Show, Kia unveiled the SP Signature concept that gave a closer preview of the upcoming production-spec SP2i SUV. 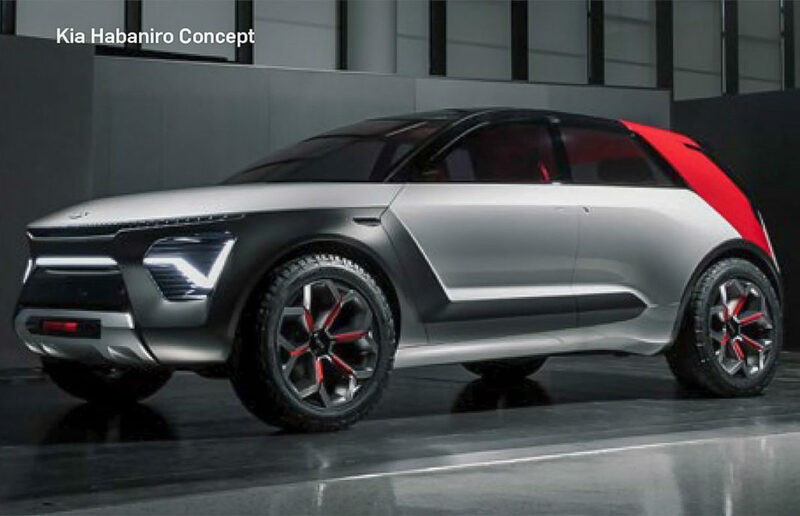 The South Korean auto major is known for often unveiling new concepts and in the newsletter for the New York Auto Show, the Habaniro concept was revealed. The 2019 NY International Auto Show is just a few days away and it will open for the press on April 17. Kia’s show floor will take the centre stage as the road-going SP2i bound for India by June or July will likely be unveiled and it will be accompanied by the rather aggressive Habaniro concept. It has an exterior that we have never seen before in a Kia as the signature Tiger Nose front grille was not even remotely considered. It adorns a prominent skid plate, a swooping bonnet structure that slightly dips down at the edges, a horizontal LED strip covering the width of the concept, blackened windshield and glass arena with partly red painted at the back, etc. There has been a dark themed thick cladding situated in an unusual position on the side profile forming a Z-shape while the silver skid plate is positioned just ahead of the LED strip. Despite having a bold front end, Kia has managed to keep the crossover character intact and the bodywork has a smooth profile with a set of hidden door handles. Devoid of regular wing mirrors suggesting the presence of around view monitoring camera, it rides on chunky wheels with off-road rubber that further enhance the utility nature of the Habaniro concept. Kia could introduce the concept in electrified and hybrid powertrains but no official information has been announced yet. Kia’s parent brand Hyundai will host the global premiere of the Venue sub-four-metre SUV at the Big Apple and it will go on sale in India on May 21. It will be offered in three powertrain choices internationally and get Hyundai’s Global Blue Link connectivity with 33 features and of them, 10 are tailor-made for India.